This is the scenario that was to be the back-up for the Santander battle. The uneasy lull in the recent unpleasantness between France and Austria seems to have come to an end. 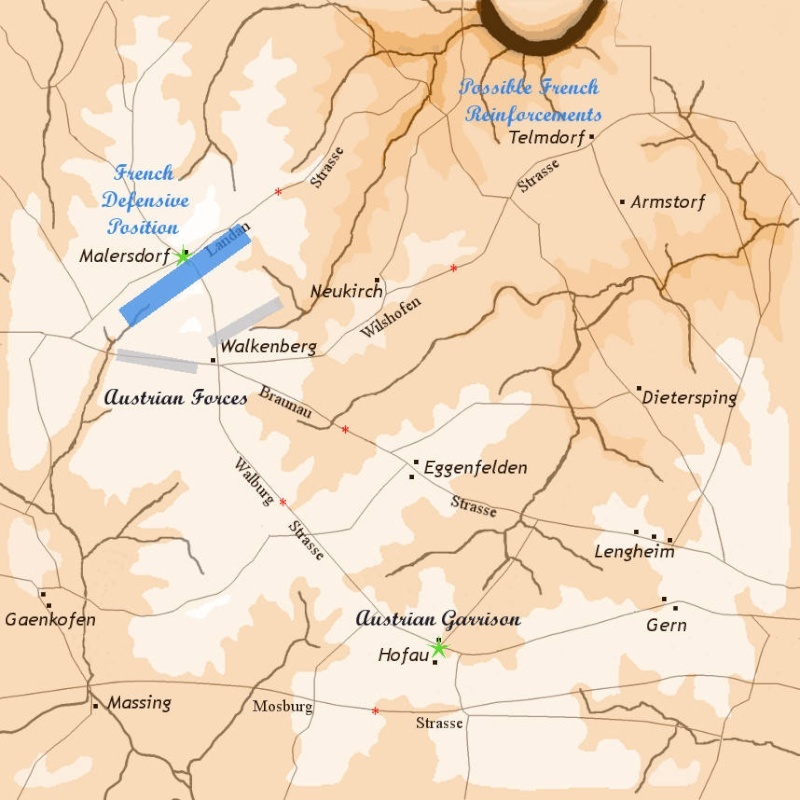 Marching up from the southeast, an Austrian corps under command of Feldmarschall von Hohenzollern-Hechingen ejected the French light cavalry out of Walkenberg and has deployed into a line of battle. Elements of Maréchal Lefebvre's VI Corps is holding the vital crossroads at Malerdorf. Loss of this road junction would allow Austrian depredations to the French army's rear. The Emperor won't stand for this. The Austrians have their own worries. The Feldmarschall's supply depot is located at Hofau. It's loss and destruction would force a rather hasty retreat south of 2. Korps. The depot garrison has remained behind to guard against any marauding French cavalry. This 3 hour battle will be fought on the Chancellorsville East map. Everyone will need the Chancellorsville expansion. In addition the three mods, KS Sprite Mod 1.00, KS Supplemental Maps 1.06 and the KS Napoleon Mod 1.717 are also needed. We will need a minimum of 6-8 players for 2 sided game and 3-4 players for co-op. It would be well to have people step up in advance to be CinC. Both sides need to think a bit on how to approach this battle. It's titled, "No Good Choices." It looks like 20:00 BST will be the start time. Let's try to start the battle as close to this time as possible. All players should download the latest version of the KS Napoleon mod, version 1.717 and Supplemental Maps 1.06 before the game. Right now we have 5 confirmed players so we'll play the co-op version if a 6th does not show up. Gah. Sorry for the no show guys. I did the math wrong and showed up 2 hours late. I've been working evenings all week and am pretty muzzy headed today. could someone please post the replay? Sorry to leave early guys! The crossroads was safe and the Austrian Supply depo was safe when I left so it appeared to be a stalemate! Are you going to host a game today, Kevin? Yes, I can throw something together today, although I don't know if we'll have enough for PvP. I suggest we start at 19:30BST. If I am able to make it I will be there. Depends on when we get back from Church. If not have a great game!